Sunday morning worship service is at 10:00 AM. The Lord’s Supper is usually observed on the first Sunday of the month, during the morning service. Fellowship hour follows the Sunday morning service in the fellowship hall. 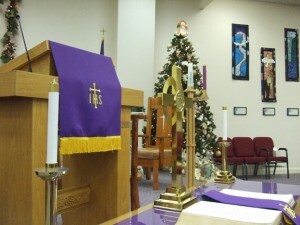 Prayer services and seasonal services are also offered – please contact the church office for up-to-date listings. To access online audio files of our Sunday morning worship sermons, click HERE to go to our Resources page. All are welcome to worship with us! Come just as you are: social standing, personal status, background, clothing, gender, race, family – these things do not matter, for the ground is level at the foot of the cross. Our worship highlights the saving work of God, always considering the loving care of our heavenly Father, revealed in the face of our Lord Jesus Christ, Savior of the world, and present with us in the power of the Holy Spirit. In our worship you will find a uniting of Word and Spirit, as Jesus said, “The Father is seeking worshipers who worship Him in Spirit and truth” [John 4:23-24]. The worship service flows structurally around the Word of God, in sung, read and preached forms, and calls for a response of humility and openness to the work of the Holy Spirit in communal and personal life. Our worship seeks to be transformational: as we encounter Jesus Christ through the Holy Spirit, we are mysteriously changed, in ongoing relation with God. We aren’t perfect, but in grace we have a new identity and ideal. This new identity is made real to us in worship. As the Larger Catechism states [cf. A. 155], we are ‘pulled up out of ourselves’ and into our true selves – drawn into new life in Christ, renewed in worship! So, come just as you are, and join us at the foot of the cross. Discover your destiny in worship – changed, in ongoing relation with God. We aren’t perfect, but in grace we have a new identity and ideal. This new identity is made real to us in worship. As the Larger Catechism states [cf. A. 155], we are ‘pulled up out of ourselves’ and into our true selves – drawn into new life in Christ, renewed in worship!